Watermelon is a fruit that’s delicious and a great way to enjoy a dessert, especially during hot summer days. 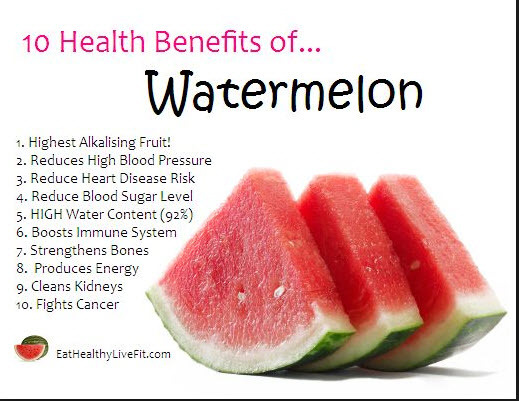 But, did you know that watermelon also is great for your health! Studies show it may help curb your risk of cancer and diabetes as part of a healthy lifestyle. Watermelon contains lycopene, a powerful antioxidant that helps fight cancer and hardening of the arteries. The lycopene in watermelon helps make it less likely that you get sunburned. Also, keep using your broad-spectrum sunscreen with SPF of 30 or higher every day. This fruit is rich in an amino acid called citrulline that helps move blood through your body and can lower your blood pressure. Studies show that it may lower your risk of heart attacks. A natural pigment called beta-cryptoxanthin can protect your joints from inflammation. Some studies show that over time, it could make you less likely to get rheumatoid arthritis. One serving gives you more than 30% of the vitamin A you need each day. This nutrient is one of the keys to keeping your eyes healthy. It’s is 92% water, and helps you stay hydrated. Every cell in your body needs water. Even a small shortage can make you feel sluggish. If you get really dehydrated, it can become serious enough that you need to get fluids by IV. Vitamins A, B6, and C help your skin stay smooth and supple. Its high water content, antioxidants, and amino acids which make for a better workout and also a quick recovery. It’s also high in potassium, a mineral that can cut down on cramps. For people with digestive problems such as Crohn’s disease or colitis, this fruit is a great way to get the nutrition you need coupled with great taste. Its soft, fleshy fruit is easy for even an inflamed stomach to digest.